Over the river and through the woods. Winter is here. Our local ski resorts are opening up this next couple of weeks and finally people aren't asking me why I'm wearing a turtleneck. As a child my family would literally drive Over the River (the Columbia River that separates Oregon and Washington state) and Through the Woods (of southern Oregon) to Grandmothers house we'd go. I would stay wrapped up in a blanket in the back seat while my Dad would pull over at some point (usually in the dark) and put the chains on the tires of our Perky Polly Peugot. We always made it to Grandma's house but we also saw several cars along the way that had slid off the road. Several years ago my husband and I loaded up the Suburban with the kids, the gear, and the two dogs and set off for a very routine winter travel excursion that would take us up and over two different mountain passes. As we started up over the second pass the weather began to change. For some reason there was alot of traffic on the road that day. The road was fine. It was bare but even still there was snow piled up on either side of the road and the road was a little wet. The traffic started to slow down and we all began traveling at a very slow speed because the weather started turning from rain to heavy snow. As we headed over the top of the pass and on to the downhill side we could see more traffic ahead but it was going even slower. Then time slowed as we saw a semi truck ahead of us start to slide across all lanes of traffic. At one point we got a quick glimpse ahead of the semi to see that there were several cars that were facing all different directions and beginning to pile up. The semi was trying to avoid this pile up but there was nowhere to go. It became clear that we were going to be next in line after the semi which was at this point sideways on the highway. The road was so icy there was no stopping. 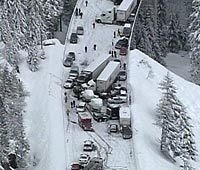 I was driving and I remember hearing my husband suggest I turn the wheel so that when we slid into the semi (which was happening there was nowhere for us to go but into the semi) we would slide into it broadside and hopefully dispurse some of the energy of the hit. This is exactly what happened. We hit and came to a complete stop. That was fine but then car after car continued to ram into us and into cars behind them. When the collisions ended there were somewhere between 50 and 60 cars involved. We were approximately car #26. Miraculously no one in any of the cars was seriously injured although one small car was entirely wedged under a semi which was SUPER scary. I was dazed but fortunately my son and husband were with it and got right into rescue mode. Two of our back windows had busted out. Apparently someone behind us lost a ski from the top of their car that had zoomed through our back window and out again through another window. Our two dogs were both in the back of the suburban in heavy duty plastic travel kennels which probably saved their lives. They were comfortable in there with warm blankets and protected from all of the shattered glass that had rained down into the back of the car. Our daughter had a bruise from her seatbelt and my concern was that there was more damage internally but we were all trying to remain calm and so I didn't say anything to her. My son grabbed the duct tape from our emergency kit that we carry in the car and he duct taped an extra blanket and some newspaper over the windows because we didn't know how long we would be stuck on the mountain side before we were able to get out of there and it was still snowing pretty hard. My husband and son walked down the road a bit to make sure everyone was ok since they are both trained in Outdoor Emergency Care and to find out what the plan was to get us off the road. For me the rest of the night was sort of a blur. Emergency workers appeared on the scene and eventually everyone was bussed off the mountain to the next town where there were some motels and a couple of restaurants. News crews wanted to interview my kids (because they are such darling kids and it would have made for great video) but I was too unnerved by this event to have my kids used for the evening news. Fortunately, we were able to reach a relative who lived nearby and they came and picked us up and drove us to our next destination so that we could get a rental car and regroup. Thinking back on the event now I can't even really remember the order of events. It has all become a bit of a blur. So when I was asked to participate in a #WinterHappens Travelingmom.com twitter chat I jumped at the opportunity. When Winter Happens the last thing you want to be thinking about is "What do I do now?" All I could think about was my kids and my dogs. I was thrilled that the car did its job for us and gave it's life in order to keep all of us safe. But then all I wanted was to be able to call one phone number and say "Please help me make sense of this and tell me what to do next". This was not the case for us. We were mired in accusations that this was possibly our fault or that we could have done something to prevent this from happening to us (yeah car #26 of #60). We had doctors to visit and we had to reclaim all of our items from our totalled car and get a new car and I don't know what else - it was a traumatic experience and I didn't want to do anything but curl up in a blanket, sit on the couch, hug my kids and watch a light hearted winter movie that has a super happy ending. This Monday the Travelingmoms are going to be talking about winter travel and travel insurance. How do you prepare for winter travel and what do you do when #WinterHappens. Join the #TMOM Monday night Twitter party at 9 p.m. ET on November 25 to talk about winter travel, sponsored by TravelGuard. HOW TO JOIN: Follow the hashtags #TMOM and #WinterHappens during the party. 2. Sign up for the TravelingMom newsletter (or let us know if you are already a current subscriber) in the Rafflecopter widget. 3. Have at least one tweet on the party from 9-10 pm EDT on November 25. For more information check out the Travlingmom.com website. This is part of a sponsored twitter party. The totalled Suburban and my thoughts about it are my own. The picture above was from the actual accident but only shows a portion of the pileup.